I have spent the last few days beginning to piece together all the signatures. It is quite a task but coming across signatures I recognise from the workshops reminds me of the sessions and people involved. The variety is so great it is a real pleasure and visual treat. The method I have decided on means chance will play a part in who ends up next to who. Its a situation I have come across before in participatory collaborations and is actually something I relish. Working with such a mix of people and communities means it is always hard to plan for every eventuality and so this will be reflected in the outcome. 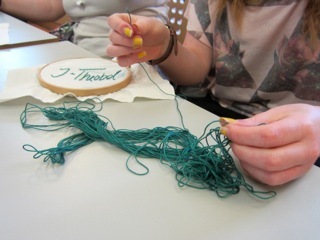 We have 2 sessions on the 21st and 24th Sept back at Touchstones so I need to have it all put together by then. 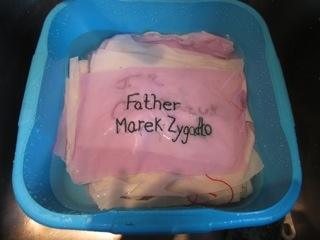 The final final signatures arrived in the post yesterday, just in time to fit into the finished cloth. To my delight and surprise the last one was that of Lisa Stansfield the singer. Although the project is mainly about representing the unrepresented, it is nice to have her on the quilt. I do hope its genuine? Of course fakes do happen but I her birth date matches with the form. 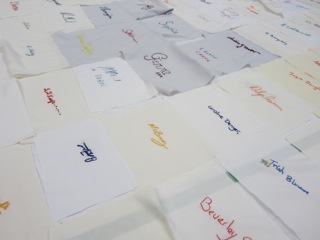 I picked up over 100 more sewn signatures yesterday from Touchstones. A lady from the Polish Community was there dropping some off. She was very unassuming and did not want to be named, but said how much they had enjoyed the sewing. I know there had been reservations from some older people, especially, a hang over from the war and being named I think? Thankfully we have at least 20 so this important community in the borough is represented. I am not sure what the initials refer too? I will check with Alison, any ideas. 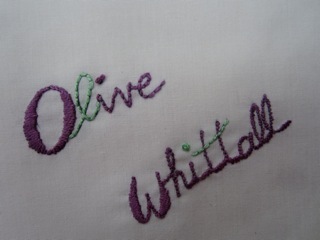 The lilac pillowcase I “found” in Rochdale has been used, something I will have to work into the final quilt. 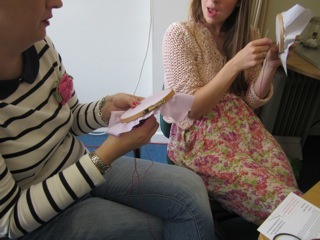 I am so glad I used recycled fabrics from Rochdale, it embeds the ground cloth along with the sewing to the borough. a few have whole family names on one square and I noticed some all worked in the same colours, denoting family members I guess? We discussed the exhibition outline and what will be displayed, it will be interesting to have the old and new quilts in the same space. Especially how signatures have changed, Alison Slater has done so much work on line researching the 1895 quilt, it is a tall order editing it all down. There was some discussion on the unusual amber/gold and black colour palette employed and whether it had any relation to the founding of the Rochdale Hornets around that time. Again help is needed, any ideas? 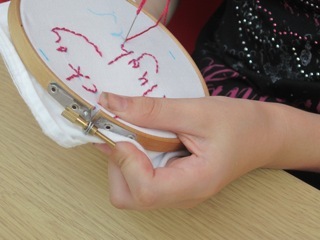 The deadline for handing in the sewn signatures is today at Touchstones, although we have a little flexibility, and should be able to incorporate any that come in this week. 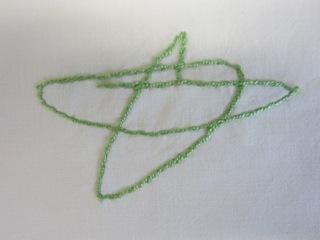 After a holiday it is good to get back and start working on bringing it all together in more ways than one. It will be nice to meet at Touchstones this week, planning the next stage, and discussing the format of the December exhibition. 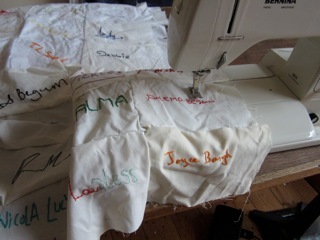 It is an interesting crossover in that Norwegian artist Lise Linnert who’s name has come up a few times is working on a show in Liverpool (something I might look into as part of my ph.D) She asks individuals to sew the names of disappeared women in Mexico to raise awareness of their plight and then displays them pinned to a wall. As she does more sessions in different places she amasses more and so the numbers increase. The art/craft methods are interesting to compare. Obviously my work is about the invisible or overlooked too, but involving and documenting local people. 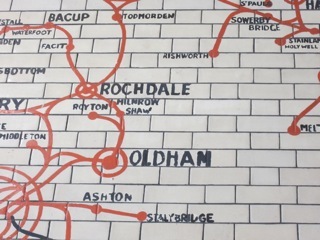 “Please sign here” once complete will stay in Rochdale and be part of their collection. Links to the historic quilt are significant too and this is helping to inform my strategies for making a new signature quilt. 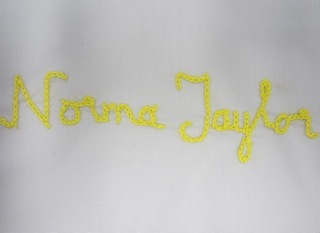 I have spent a couple of days thinking about and exploring ways of sewing all the signatures together. It is hard to plan too much in advance with collaborative projects like this, you can never be certain, how many people will actually be involved. 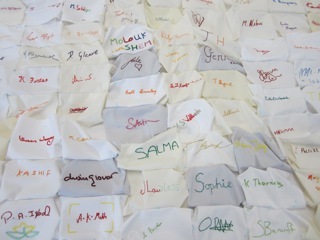 To date we have 216 with possibly 50 – 75 more to come from numbers of packs that have been collected from Touchstones. 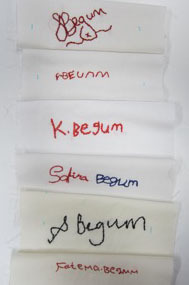 A few of the Begum’s I have spotted so far. It is interesting as I reflect on the early sessions now looking at all the signatures. 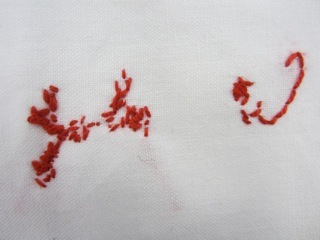 I decided from the outset I would include all the sewing no matter whether it is legible or well sewn. If you begin to mess with one in anyway, where do you stop? 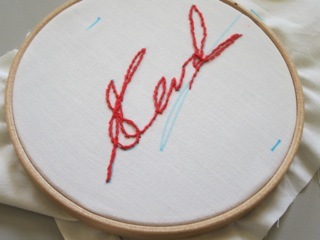 The range is amazing, from styles of writing to skills in embroidery. I have photographed a number of compositional ideas and as I am on holiday for 10 days I am going to mull it all over before a final decision of the format of the cloth. Quite a responsibility, everyone will want to see their signature and it needs to look good too. 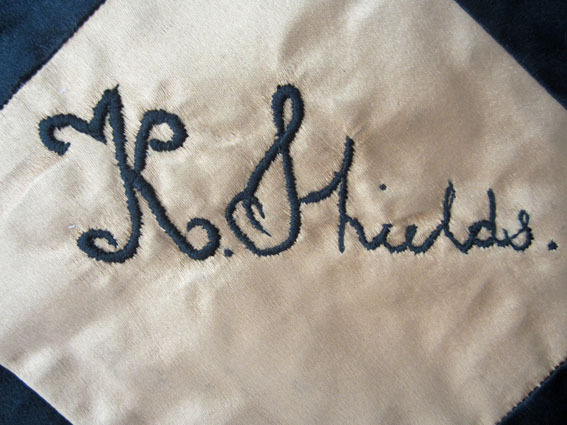 Found a signature I photographed from the 1895 quilt – compare styles. The last session collecting signatures took me to Littleborough. For a change I decided to take the train, passing my favourite map in Victoria station. 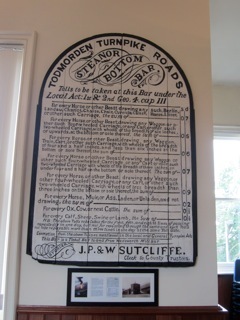 I popped into the Littleborough Museum on the station, home to some lovely artifacts including war memorials. I also called in at the charity shops on the way to Ebor Studios and picked up a cotton pillowcase for the project, they are pretty hard to come by these days, so many are poly cotton. 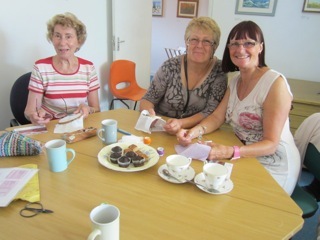 Cheryl who runs the monthy craftanoon at Ebor hosted our sew in and provided tea and cakes for everyone. 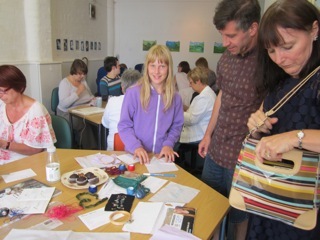 It was a busy session with lots of enthusiastic sewers, including two lots of sisters and a few family groups. One of the ladies had actually been to school in the building that is now the studios, previously known as Jubilee Hall. She said the main school was across the road but they came to the hall for dinners and the older children did crafts and work there. She recounted doing some knitting and being mortified when the teacher told her to ladder it to make a pattern. The latest venue for collecting signatures was the sports centre in Heywood. There were two tables and lots of chairs which did create a nice working environment. 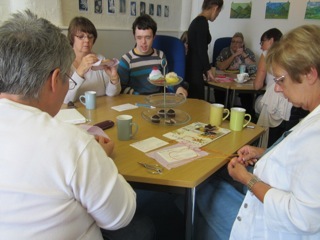 The feeling was very different to other sessions and lots of children and families came and chatted. A few staff came and added their signatures to at the end of their shifts. 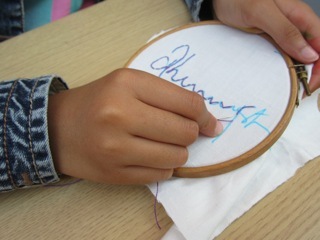 As the project is only open to adults, the children sat and sewed their parent’s signatures or I gave them ones that had not been sewn which they stitched with relish. 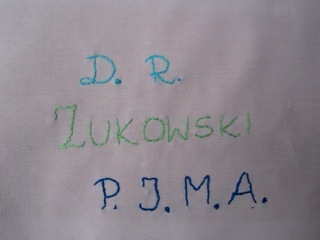 There was overall a very positive response to the project and again, people who had classes and so were not able to sit and sew, donated their signature to the quilt. 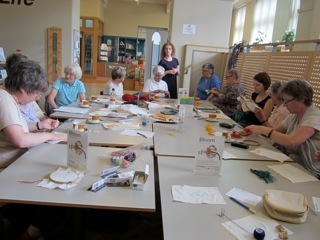 Back in Touchstones for a session to coincide with the monthy knitting group. 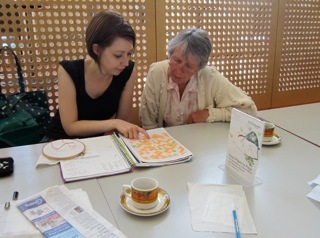 Alison Slater came along and shared some of her findings on the historical quilt with the group. 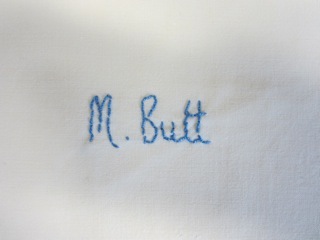 As usual people came and went, I sewed a couple of drawn signatures. 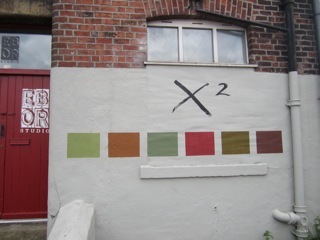 Alison Cooper was back from holidays too, so we went up to the gallery and discussed ideas for the exhibition space. I also went and rummaged with Alison Slater in the charity shops for more pillowcases, as all the fabric packs at Touchstones have gone. I bought two white and also a couple of lilac ones. 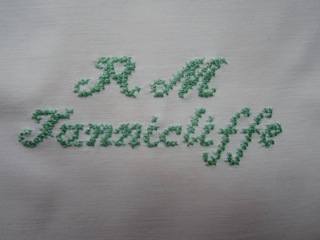 Not too sure about the colour but it can be a stand by if I can’t find more white/cream cloth?